Well, as this was the least bit difficult to predict, the Sadr Wall, despite a truce that was called between American/Iraqi forces and Shiite militias days ago, has become the stage for a perpetual war now – a war over the wall, as the New York Times simply puts it. Of course this was hardly unseen as the likely outcome. After all, what else do these types of massive blast wall installations serve in the end but vertical stages for war? 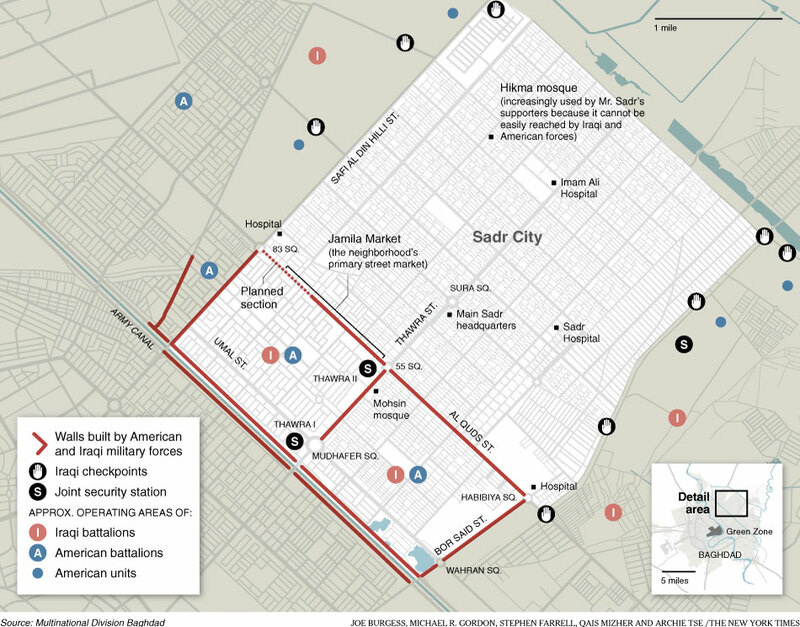 In order to try and create a safety zone in the southern sector of the Shiite enclave, American forces have been building for the last month a divisive concrete wall across Sadr City, working its way East to West, which, according to the Times, is roughly three miles long now and eighty percent complete. But, the Sadr Wall is far from safe as a permanent structure. Shiite groups have been attacking it relentlessly, blasting holes through it, wiring chunks of it with explosive booby traps, turning the wall into a magnet for specialized roadside bombs, and literally using trucks to tear portions of it apart. Beyond that, the warfare between Iraqi and American miitary forces with the Shiites has led to the complete annihilation of nearby buildings, Shiite attack positions, while streets have been churned over by missiles, tank and mortar fire -- essentially, the city of Sadr is being gutted, disemboweled for the sake of this crude medieval wall, that seems far from providing anything other than fodder for endless war. To think, a city could be ruined by a single Wall. It's certainly not a new concept, but one that has been around so long you would think new concepts might be explored at this point in history. Anyway, I don't know, there is just something so rudimentary about a wall, the clashing dynamics of a wall, the basic border politics of a wall. It's like the most ancient ingredient for conflict in the book. So, how long will this last, how long will the wall stand? What will be expended to keep it standing, what will be the final cost of that, in concrete, in human life? In some ways, the strategy of the wall seems much like the strategy of Iraq itself. It was a way to draw the fight to a specific location, thereby, in a chaotic sort of way, controlling its geography. Though the stated purpose of the Sadr Wall is to create a safe haven, of course everyone knew it was going to in the end facilitate full scale conflict there. Maybe safety zones are less the intent than using the wall as a magnet for fighting instead, creating safety zones elsewhere in the process? Who knows, I have no idea what I'm talking about. I'm hardly a military strategist. But maybe the area of the wall seems to be achieving what the Americans had hoped, not a safety zone but rather a new battlefield drawn into the light. Walls and war do have a close history, and they do end up being targets, but that is the point... they delay, they seperate, they delineate. Clearly, the wall has the power to delay and deny a direct attack against US and Iraqi troops. These direct threats are now more indirect threats, as you allude to with your statement about the 'vertical' significance of a wall. It helps to create a focused stronghold in an area that would otherwise be overrun. Yes, the implications may not be pretty, but at least it affords a few extra advantages to the good guys (including a more focused fight). Mr. Gorbachov, Tear down this wall!